Colocasia Electric Blue Gecko PP26,153 Another great introduction from our breeding here at Brians Botanicals. This new Colocasia Gecko tm series concentrates on colorful new hybrids for the garden. Colocasia Electric Blue Gecko?PP26,153 is no exception. 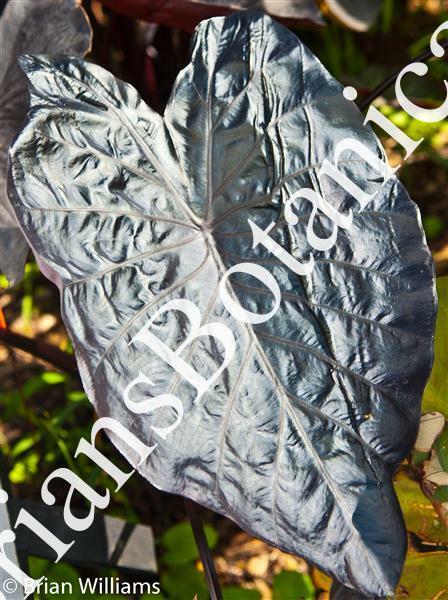 This dark Colocasia has very dark stems and foliage and grows to 3 to 4 feet tall. Each leaf has a unique reflective sheen depending on the amount of light the foliage can look deep purple, black or even metallic-blue. Making this a great addition to the Gecko series. Plants work great in containers or in garden beds. Great for contrast with other plants or even other plants in the Gecko series such as Red Eyed Gecko, and Lemon Lime Gecko.